Self-publishing is nothing new – and neither is piracy. The first book of Don Quixote by Miguel de Cervantes was published in Madrid and was immediately pirated in Lisbon. "I would venture to swear," said Don Quixote, "that you, sir, are not known in the world, which always begrudges its reward to rare wits and praiseworthy labors. What talents lie wasted there! What genius thrust away into corners! What worth left neglected!... But tell me, sir, are you printing this book at your own risk, or have you sold the copyright to some bookseller?" "I print at my own risk," said the author, "and I expect to make at least a thousand ducados* with this first edition, which is to be of two thousand copies that should sell in the blink of an eye at six reales** apiece." "A fine calculation you’re making!" said Don Quixote. "It seems you don't know the ins and outs of the printers, and the false accounting that some of them use. I promise you when you find yourself weighed down with two thousand copies, you will feel so careworn that it will astonish you, particularly if the book is unusual and not at all humorous." "Then what!" said the author. "Sir, do you wish me to give it to a bookseller who will give three maravedís*** for the copyright and think he is doing me a favor? I do not print my books to win fame in the world, for I am already well-known by my works. I want to get something out of it, otherwise fame is not worth a cuatrín****." *1,000 ducados, in today’s prices and currencies, might equal roughly €28,125 or US$35,600. 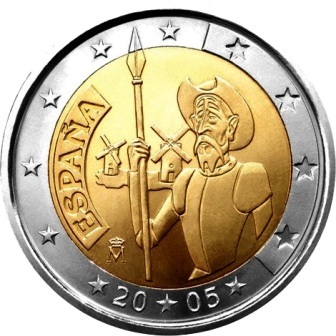 By comparison, Cervantes may have received about 100 to 125 ducados for the first book of Don Quixote. The contract has been lost, but that price is in keeping with what he made for other books. **6 reales, in today’s equivalent currencies, might be about €15.35 or US$19.43. The first book of Don Quixote sold for 290.5 maravedís, or about €21.78 or US$27.57. ****A coin worth so little that no one recalls its value anymore. We could translate it as a “penny” or “farthing” and probably be close to the original meaning.